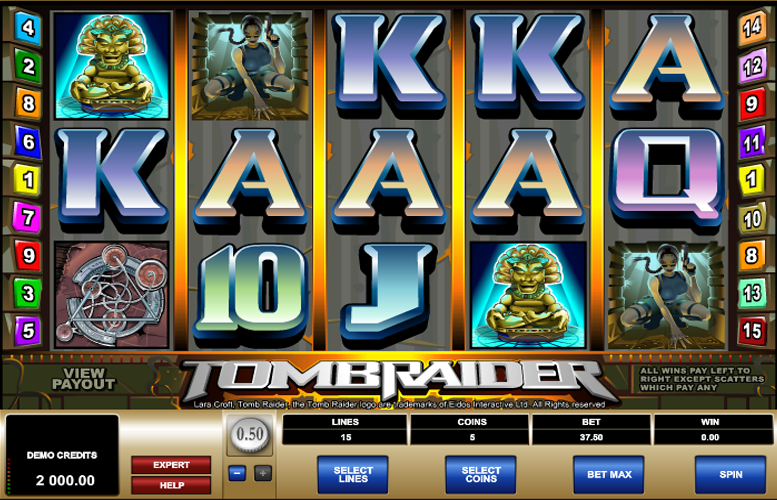 The Tomb Raider slot machine from Microgaming is up for review today. It features five reels and three rows of symbols. There is a free spin mode and an extra juicy bonus pay-out too. Unfortunately, the slot itself feels rather dated. It lacks any animative touches to bring it to live. Considering the subject matter, this feels like a bit of a waste. In addition, the artwork throughout just feels uninspiring. It’s by no means the greatest slot machine ever. We had high hopes too, given that we’re big fans of the original Tomb Raider video games. High prize weighting. Despite the rather uninspiring features and artwork, the prizes are reasonably juicy on the Tomb Raider slot machine. If you don’t care about looks or gameplay and just want to drop a decent pay-out, this might be the game for you. Dated feeling game. There aren’t any flashy animations and the symbol designs aren’t very inspiring. The Tomb Raider slot probably didn’t look all that impressive in 2008, let alone 2018. Low upper betting limit. Players who want to seriously splash the cash will be disappointed by the maximum bet of £37.50. This criticism only applies to the highest rollers, however. “Wild” Tomb Raider Logo = 7,500x the line bet. Puzzle or Lara = 500x the line bet. “Scatter” Lara with guns = 400x the line bet. Tiger = 250x the line bet. Three idols = 36 – 1,500x the line bet. Four idols = 48 – 2,000x the line bet. Five idols = 60 – 2,500x the line bet. Players should note that bonus wins are not multiplied by three and can be triggered during the free spins game. Any bonus wins are added to the pay line wins. Landing three or more gun toting Lara “scatter” symbols anywhere on the reels will award 10 free spins. During this round, all wins will be subject to a 3x multiplier. Players should also note that this bonus can be retriggered. Ace = 125x the line bet. King or Queen = 100x the line bet. Jack or Ten = 75x the line bet. 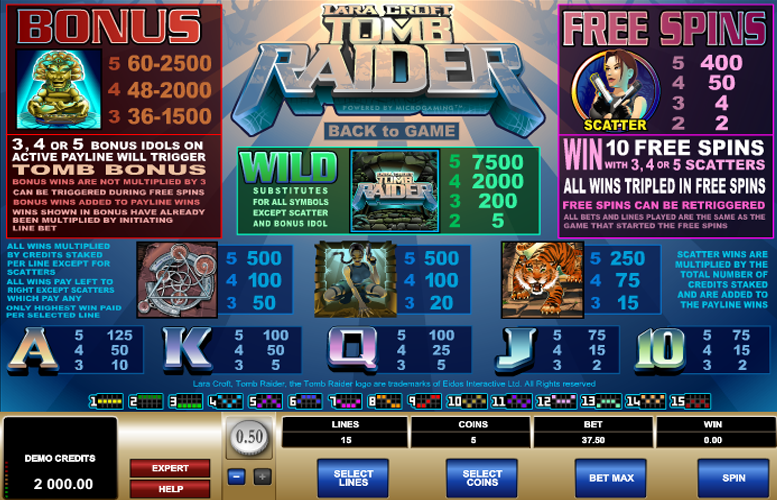 Players are given maximum reign over how they distribute their bets on the Tomb Raider slot machine. They can change the number of lines they play on every spin, along with how many coins are bet on each one. Finally, they can alter the value of each of the coins wagered. They can choose between one and 15 pay lines, between one and five coins, and between 5p and 50p as the value of each one. All this means, with everything set to the minimum, the lowest possible bet per spin is just 5p. Meanwhile, with everything maxed out, the highest possible bet per spin is a curious £37.50. Whilst most players will find this adequate, it’s not hard to imagine some high rollers finding it somewhat limiting. All things considered, the Tomb Raider slot machine is a bit of a let-down. The artwork is dull and dated. When the somewhat boring gameplay is added to the mix, the entire package just feels uninspiring. The game’s features are staples of just about every slot machine going, so there is no respite from the criticism there either. The Tomb Raider slot’s one saving grace is that it does feature some rather top-heavy payments. The “bonus” idol feature, although not particularly riveting, can result in some massive pay-outs. Whilst this machine is definitely showing its age these days, we’re confident that Microgaming (or perhaps another slot manufacturer) will have a new offering to coincide with the rebooted movie that is coming this year. Watch this space. This game has a rating of 3 / 5 with 248 total reviews by the users.